The new rule, released Friday, would bar organizations that receive federal Title X money from referring patients to abortion providers. 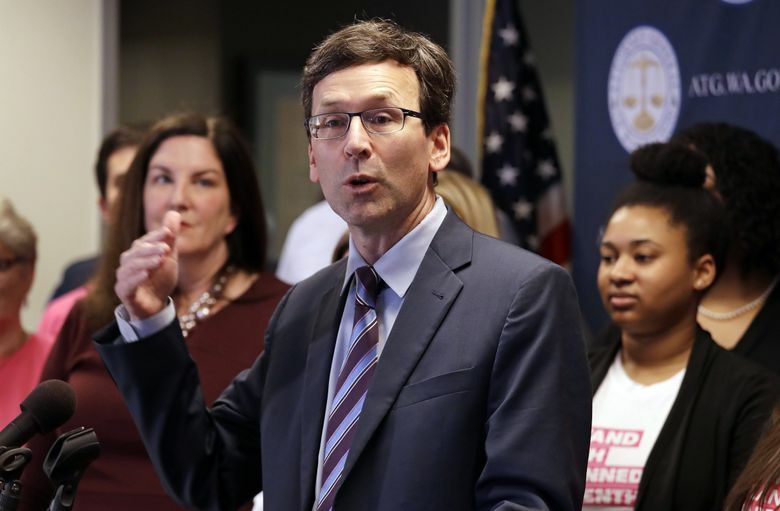 Washington state Attorney General Bob Ferguson will sue in an effort to block a new Trump administration rule that bars federal family-planning money from going to health-care organizations that provide referrals for abortion. The new rule, announced Friday, would create obstacles for women, particularly low-income women, seeking abortions. It would bar organizations, such as Planned Parenthood, that receive federal Title X money from referring patients to abortion providers. Organizations that receive those funds would still be able to perform abortions, but would have to do them in physically separate facilities. Providers have long had to financially separate abortion services from other services they provide. Ferguson said Monday he would file a federal lawsuit in the Eastern District of Washington as soon as the rule is formally published in the federal register, which could happen at any time. He said he would also file for an injunction to block the rule from going into effect while litigation proceeds. The National Family Planning & Reproductive Health Association said it would file a separate lawsuit to block the new regulations, and other Democratic-led states are expected to file legal challenges, Ferguson said. Planned Parenthood said the new requirements for physical separation of facilities would be costly and all but impossible to fulfill. Planned Parenthood said the administration is making another attempt to drive it out of business, after efforts to deny funding failed in Congress. Title X, a 1970 law designed to increase the availability of family-planning services, provided care to more than 91,000 patients in Washington in 2017, according to Ferguson’s office. Nearly 90 percent of those patients receive care at Washington Planned Parenthood clinics, which would lose more than $3 million in federal funding under the new rule. If the rule goes into effect, the number of Washington counties without any Title X-funded clinic would jump from five to 21, Ferguson said. Marjorie Dannenfelser, president of the Susan B. Anthony List, lauded the Trump administration for the increased restrictions. The rule “does not cut family-planning funding by a single dime and instead directs tax dollars to entities that provide health care to women but do not perform abortions,” Dannenfelser said. This would be the 34th time Ferguson has sued the Trump administration, according to the attorney general, who said his office has won 17 of those cases in a row. The Reagan administration imposed a similar, but stricter, rule in 1988, which would have blocked funding to any organization that even provided counseling about abortions. The Supreme Court ultimately ruled that those restrictions were permissible. But the case wasn’t decided until near the end of President George H.W. Bush’s term, Bush never implemented the regulations, and President Bill Clinton withdrew the rule.